Satellite image of the Grimsvötn 2011 eruption taken on the 22nd of May. Wikimedia Commons. In the previous part we learned that Grimsvötn indeed is able to produce large scale eruptions as we looked closer into the Saksunarvatn tephras. The first part can be found by following the link below. This time we will look into what this new information might mean for the future eruptions of Grimsvötn. But first we need to look at the cycles that affect Grimsvötn. Icelandic volcanism is normally governed by two different processes that may be related to each other in various ways that we do not fully understand yet. These are the magmatic pulse cycles determined by increased influx from the mantleplume and the rift cycles as Iceland is being pulled apart. There is also ample evidence that we are entering a third man-made cycle caused by melting of the large glaciers that overlie several of the larger Icelandic volcanoes, a form of man-made isostatic rebound. Let us look at these individually. It is normally said that statistics is unimportant when talking about volcanism and as a tool for volcanic prediction. This should be taken with a large pinch of salt. If you have a large enough collection of sampling of eruptions and a large enough collection of volcanoes you can sometimes deduce a few things. On average Iceland suffers from an eruption every 7 to 10 years, but if we look at the historic distribution of these eruptions we will find that there is an ebb and flood to how they are distributed. During the “floods” you will see eruptions roughly every third year and during the “ebbs” there can be as much as 20 years or more between eruptions. At no volcano it is as marked as at Grimsvötn since it is the most frequent erupting volcano in Iceland. On average it erupts ever 10 to 12 years and about every 3 to 7 years during a heightened period of eruptions. During the low periods of activity there can be between 20 and 50 years between eruptions. During most of the twentieth century there was a low period. Up until 1938 it was business as usual with frequent eruptions, after that there were only two eruptions that we can be certain about before 1983. Then there was a lapse for 18 years prior to the 1954 eruption and another 27 years until the 1983 eruption. After that the trend turned, both in intensity of eruptions and frequency. In 1996 the large mainly effusive Gjálp eruption took place (VEI-3), the next one was only two years later in 1998 (VEI-3), then came the 2004 eruption (VEI-3). After that came a 7 year long lull before Grimsvötn pulled something that was at the time unexpected. It’s most explosive eruption since the Saksunarvatn Tephras. The eruption is rated as a very large VEI-4 or even a small VEI-5 with a combined dispelled 0.8 cubic kilometers of tephra in Dense Rock Equivalent. If we combine that with what is believed to be 1 cubic kilometer of lava emplaced under the central caldera lake it was a whopper of an eruption however you count it. It is to date the largest eruption this millennium on Earth. The general average for this cycle is roughly 130 years, but it varies slightly so from peak to peak there could be as little as 100 years and as much as 160 years. If we count from the peak of Grimsvötn, Katla and Bárdarbunga eruptions we would get roughly 100 to 110 years between peaks for this cycle (if we count that we right now have the peak of the cycle, but it is probably about 10 to 20 years before the true peak arrives). It is not likely that we have reached this peak yet since we have not seen eruptions from Askja, Katla and Thordharhyrna as of now, and they normally come out and play around the peak. We tend to talk about the Icelandic Rift Cycle and mean the one that is taking place in the aseismic area between Torfajökull, Bardarbunga, Thordharhyrna (on the Grimsvötn Fissure Swarm) and Katla. This area is sometimes called The Dead Zone since it is so devoid of seismic activity, but we know that as soon as an eruption is on the way there it is very seismically noisy. But talking about this tiny area as The Icelandic Rift Cycle is wrong. Iceland is filled with other rift cycles that can be equally large in effusive size. We have the 5000 year rift cycle of Theistareykjarbunga, the 3000 year cycles of Fremri-Námur and Heiðarsporðar central volcanoes. Krafla and Askja also seems to follow roughly 250 year long cycles and The Vestmannaeyjar show at least partial evidence of following the same pattern. The rifting cycles are though offset from each other in time with Krafla and Vestmannaeyar cycles most often happening prior to the Dead Zone rifting cycle. If we look over at Reykjanes it seems to be running on a 1 000 year cycle. There is one thing that leaps out when you look at the different cycle patterns. There seem to be a line of rifting that is more potent compared to the rest of Iceland that starts at Krafla and runs via Bárdarbunga/Grimsvötn down via Katla to the Vestmannaeyjar. Sometimes parts of this rifting line is skipped over so there is no certainty that a rifting event will happen at any particular area, but the statistical chance is about 75 percent that a rifting episode will take place every 230 to 270 years in each segment. For The Dead Zone these rifting cycles take place at the fissure swarms of either Bárdarbunga (Veidivötn, Vatnaöldur or Thjorsahraun), Grimsvötn (Lakí or Raudholar) and Katla (Eldgjá). In regards of which of them is more likely to erupt there is just no way to say as of now, all we can say is that there is a 75 percent risk of one of them going off and that if that happens that it will be between 5 and 30 cubic kilometer in size. From “Structure of the Grímsvötn central volcano under the Vatnajökull icecap, Iceland” by: Alfaro et al. After the last Ice Age there was a 2 500 year long period with very intense volcanism in Iceland caused by decompression melt due to the intense isostatic rebound. This period contains the largest eruptions in Iceland, both effusive and explosive. On the effusive side we have the 30 cubic kilometer Thjorsahraun (the largest Holocone lava flow), The 35 cubic kilometer formation of Skjaldbreidur and the 50 cubic kilometer combined eruption that caused the Theistareykjarhraun and the Theistareykjarbunga Shield Volcano. We also had the Vedde Ash from Askja and the Saksunarvatn Tephras from Grimsvötn. The later of them we now know is the largest explosive sequence in Europe since the end of the Ice Age. The reason why this is so important is due to human stupidity. We are now causing our own man-made deglaciation and isostatic rebound due to antropomorphic heating. In about 100 years there will be no more glaciers on Iceland, and the isostatic rebound will cause large scale decompression melting of the mantle under Vatnajökull. We know from historical eruptive records and tomographic images that the magma reservoirs under Grimsvötn are fully reformed and that by now the volcanic system is erupting all of the influxing magma. If we combine this with the occurance of two upcoming cycle peaks coinciding we have a situation where there is an increased risk of a larger eruption than normal from Grimsvötn. The magmatic pulse cycle means that during the next decades the volcano will receive more magma from the mantleplume and that the volcano will be suffering from increased strain at the fissure swarm running through the volcano. The increased rate of eruptions and eruptions size increase is also causing an increased risk of magma reservoir failure due to fatigue. This last part can sufficiently weaken the roof over any of the magma reservoirs causing an increased risk for caldera formation if a large eruption occurs, or if a rifting event rapidly evacuates one or more magma reservoirs. The antropomorphic isostatic rebound will also add to the mix as additional decompression melt could occur. If we put these 3 different cycles together and add them on top of the fully reformed system post-Saksunarvatn Tephras we find a volcanic system capable of eruptions beyond the projected VEI-4 roof of possible eruption size. Against what the Koch-brothers fervently wish to be true it is nowadays well proven that we are causing a global warming. You might want to check the NOAA outgoing longwave radiation readings. In the last 30 years alone the earth has increased its radiation to space by 2.5w/m2 when it was supposed to be trapping more heat. (The total radiative forcing from greenhouse gases to date is only 2.2w/m2). Of course the 5% decrease in cloud cover detected by both satellites (ISCCP) and the earthshine project (moon reflectance) shows that the majority of warming was natural in origin. If you correctly attribute the warming to its proper causes the CO2 warming should be limited to about 1deg C. The IPCC have stated in their most recent report that “No best estimate for equilibrium climate sensitivity can now be given because of a lack of agreement on values across assessed lines of evidence and studies.”(AR5 WG1 SPM p16 footnote). The IPCC have admitted that they don’t know how much effect CO2 will have, I read that as saying that the science is not settled. Still love your articles as always. Not sure what you are refering to. The outgoing longwave radiation is plotted in the link below. It fluctuates but I don’t recognize your number of 2.5 W/m2 increase. Whoever you got that number from made it up. The OLR roughly measures the temperature at the height from where the infrared radiation escapes, which is ~5 km above the surface. It measures how well convection transfers heat from the surface to there, and is quite sensitive to El Nino conditions. But over time it is effectively constant as it has to average to the incoming radiation from the sun. What changes is the height in the atmosphere from where it comes. As the surface warms, that height increases so that the total OLR stays the same. OLR is not a surface climate indicator and I think your number is irrelevant to that discussion. There is no doubt that the Earth has warmed by now close to 1 degree. CO2 is the trigger but part of the warming is an amplification effect because warmer air holds more water and water is also a greenhouse gas. The greenhouse models fit the temperature evolution rather well. The radiative forcing you state is about right. Most of it is going into warming the oceans, which have much higher heat capacity than the air. About half the rise in sea level which we have already had is due to expansion of the water as it gets warmer. and that will continue. Even if no ice were to melt, sea level rise of close to 50cm is already inevitable. The physics of global warming is not difficult. Basically, it is akin to the fact that closing the windows keeps the house warmer. It is difficult to deny that (1) the fast rise in CO2 is human-made; (2) Physics tells you this keeps the surface warmer; (3) The effect is amplified by water vapour. The only discussion there still is is about the amount of feedback/amplification, but the uncertainties on this have come down dramatically over the last decade. The Natural world always find a way to keep a species from remaining overpopulated for too long. Apologies albert for not providing methodology for you to replicate. The 2.5w/m2 olr increase is from 1980s to present (pre el nino). Obviously when testing if global warming is correctly attributed to CO2 you need a period of warming that is attributed. Thus you must exclude the 1970s cooling period and the current el nino from the analysis. As for the enhanced greenhouse effects being verified, you must be kidding. I’m assuming you understand the models predict a coupled temp and humidity increase in the tropical upper troposphere(double temp increase relative to surface.) Of the four data set available, both radiosounde and sat temp sets show insufficient warming and the radiosounde absolute humidity is clearly decreasing rather than increasing. Only the sat humidity set is supportive and that is noisy with spacial anomalies that are unconvincing. Considering the models have been falsified by obs(ipcc) and climate sensitivity is officially unknown, shouldn’t you start questioning your previous assumptions? So you define your trend as from a non-el-nino point (1980) to the peak of a very strong el nino (now). (By the way, that lines would be a decrease, not increase as you mentioned above).That method doesn’t work: you bias your result. You could also pick two points that give the opposite ‘trend’. The correct way to do it is to fit a line to all points. There is a mathematical technique to debias against el nino fluctuations but in this case that is probably not needed: it is pretty clear the fit is a flat line. As to your other points, which part of thermodynamics do you not accept? The physics is simple, and you must have some reason to question it. The models fit very well, from the amount of temperature increase to the global patterns, the increase in water vapour, the rapid increase in sea water temperature at depth, the cooling of the stratosphere. You accept the temperature rise. Natural climate variations at the moment do not do anything like this rate (and the Milankovitch cycle gives a downward temperature), We have an observation, we have a clear explanation, and the models have made predictions which are confirmed. We are well passed the point of arguing about whether the effect is real. Actually there is great uncertainty regarding both TCR and ECS,. Despite thirty or so years of funded research, the degree of uncertainty regarding the actual effects of increasing CO2 levels remain about where they were. Recent observational studies indicate that both are significantly lower than the values assumed by the IPCC and others. Albert the analysis is from the flat period of global temp 1981-1986 to the flat period of global temp 2003-2009. The global warming during this period is attributed to to GHG forcing but shows an OLR increases as shown in a graph here http://jennifermarohasy.com/wp-content/uploads/2013/12/AGW_Falsified_Michael_Hammer.pdf which is sourced from NOAA data via climate four you. The cause was a 5% decrease in cloud cover detected by both the international satellite cloud climatology project and the earthshine project. See climate4you climate and clouds page for details. The cloud forcing is approximately 0.9w/m2 over a 14 year period, much larger than the GHG forcing. If climate sensitivity was high we should have seen a 0.7deg C increase in global temp plus CO2 increase on top. Since temp only went up 0.4 deg total over the Sat temp period that puts the ECS at a neutral level of around 1.2. Multiple peer reviewed studies based on observations (TSI, GHG, OHC) in the last few years put ECS at 1.5-2 vs 3-4 for GCMs. These studies however attribute the entirety of the warming to GHG forcing as the only natural forcing they use is Total Solar Irradiation. This is despite half the warming prior to WW2 being attributed to natural forcing by the IPCC because humans CO2 emission were to low. Combine the Observational ECS with IPCC attribution and you get ECS of about 1deg C. The missing piece is natural changes to albedo. Rob, I am not sure what they did in their analysis, The link given for the data they used is dead. Their have been a variety of satellites uses over the years with slightly different instrumentation. One of their peaks (1995) seems to correspond to failure of one satellite (NOAA-11) where another took over. But for this to look like a spike some data handling was done, so this is not raw data (neither would I recommend you use raw data: calibration for orbital drift is important). Normally, one uses clear-sky data over the oceans. The 1991 decline is understandable: that is Pinatubo;s aerosols. There was a peak in 1998 due to El Nino which is clear in the ORL data I have seen but is absent in the plot you link to. Other than that, the published clear-sky ORL plots are constant to better than 0.3W/m^2. See Gastineau et al. 2014, published by the American Meteorological Society. Please note, the vertical scale (in Joules) had to be clipped down since the latest M4.2 made the scale to large. Well, we knew already prior to the eruption that Bárdarbunga was Icelands noisiest volcano. Yes, to put it into perspective, the M4.2 total energy is close to all of the energy from the total of all quakes since the end of eruption. I believe the collapse of the roof of the caldera or the sinking of the plug is still an ongoing process. The ice above the caldera would have initially formed a dish that dropped in the center by 60m. As time goes by, the ice will slowly flow in to the center to even out the dish. The added weight to the center of the dish would be enormous. I have marked up the illustration contained in this paper to show how the shifting ice could cause the continued pattern of subsidence quakes. Red Line – New Ice Level -over time the ice would flow into the center increasing the thickness and weight on the plug. The thickness on the rim would be reduced causing the rim to rebound and the rise in the KISA GPS located on the rim. Green Arrows – movement of the plug and rim. There is yet another thing to keep in mind here. The added weight of the ice would help minutely to hinder both decompression melt and nucleation of volatiles in the melt. Obviously this would hinder somewhat an eruption for a while. Just a thought. We see further activity in the dykes running off from Bardy, especially when we have some of these +3 rim quakes. At the moment we have Magma coming in at depth and pushing Magma into the dykes, which now then gives the ring fault a knock? Seen a lot posted about Bardy and Askja, mixing it up, could they be connected at around 20km depth? I agree that what you are saying is very possible but it could also be argued that the continued dropping of the plug would pressurize the system as well. Ian, you just produced the winner of the Plot of the Year Award. It is an eye-opener and I will have to go for a walk pondering it. No need for the walk. If we assume that the eruption was piston-driven after the initial onset (When Nornahraun opened up) and we further assume that the initial pistoning “smoothened out” the piston (plug) so that it can move more easily we get a fairly useful model for prediction I think. Let us now assume that the piston is still dropping it would indeed increase pressure, and the graph seems to substantiate this. In turn this implies that as the piston keeps dropping it will soon have raised the pressure significantly for another eruption to be possible. More or less, if this is correct, the real question is how much further pistoning would it take before we see another eruption? Here it would be important to remember that Grimsvötn does not refill to previous level before erupting. Normal number for Grimsvötn is 2 to 5 centimeters. Bárdarbunga inflated about 8 centimeters (DYNC) very rapidly prior to the eruption as the Kistufell intrusion injected itself into the magma reservoir. Since Bárdarbunga has not erupted for quite some time this could be seen as an absolute maximum of inflation prior to eruption, and in a newly erupted system it would be more akin to Grimsvötn. Currently the system has uplifted 2cm on DYNC, so with a bit of speculation we would need anything from 0 to 3 cm of further uplift prior to an eruption. Or between a month and a year and a half if the uplift and seismicity continues. Remember that this is just idle speculation. It would have been nice to have KISA readings during the collapse. There is one more possible explanation for the rise (maybe?) at this station. As the plug collapses it draws the walls (rim) downward with it and over time the rim rebounds upwards. But I do like your scenario Carl since it brings into play all of the observations and it fits quite well. If another rift eruption occured in the vicinity of Nornahraun it would mean that we are looking at a Krafla style Fires episode. That would be intriguing to say the least. I have been a long time lurker myself. The graphic above has moved me to come out of the shadows. During the whole Bárdarbunga/Holuhraun eruption, I kept thinking that the action seemed to resemble a viscous liquid being drained (siphoned) out of a sealed tank. Since the walls of the tank were quite strong, the roof seemed to be drawn in due the drop in pressure. Though some have called this pistoning, it always appeared to be more like crumpling. Now the thought that has been rattling around in my head, is if this process were to repeat itself several times and the ring of the caldera roof came to resemble crushed rock instead of solid rock trying to slide past itself and the roof literally fell into the magma-chamber during a similar rifting occurrence, would that not more resemble a piston and thus provide the energy to produce 1800 ft fountains witnessed during the Laki eruption. The next thought that I had, was if this roof then got hung up on one side and tipped, providing a path for water to the magma-chamber. Could this be a viable process to explain how very a explosive eruption from Askja, followed such a effusive eruption of Laki. Please forgive me if I have messed up the sequence of eruptions or proposed a question that has been discussed during the period that I had not been able read as much as I would have liked. I agree that what you wrote up until the Askja and Laki Part. Those two are definitely not related to each other. But the rest fits pretty well to the standard model of caldera formation. Only problem I have this time with the standard model is that there should have been more earthquakes all over the caldera roof if it was standard caldera roof blocking involved. Plug is dropping and increasing pressure at depth, forcing magma into the neighbouring systems, hence the increased activity away from bardy. This activity not being due to rifting (believe I’ve seen some long period EQ, past few Months), and the bardy EQ’s are just a result of the plug dropping. Just casual observations and no real data….I think the key to all is 20ish km down. We have concerns that your user-name might have been taken over by “He who should not be named”. And it seems like swarm season is kicking off in Iceland with one confirmed star so far out in the Grimsey East Volcano. Nothing pointing towards anything volcanic though. Nice little swarm to get warm by. Nice variation of depths. You sure write good articles Carl. Your Icelandic addiction is always a treat too. Meanwhile I’ve heard that there is developing unrest at Nyiragongo and concern from local volcanologists that it might either erupt (effusively, but into a difficult-to-quickly-evacuate city a third of which burned down the last time that happened) or cause Lake Kivu to pull a Nyos and gas the city. Reportedly, new vents have opened above the lava lake, higher on the inside slopes of the caldera ramparts, and there are new fumaroles all over the mountain. No need to apologize, should’ve looked it up to be certain. Obviously you are correct, it is Anthropogenic isostatic rebound. A VEI-6/VEI-7 eruption at the VatnaJökull (Barðarbunga, Grimsvötn) area will wreak havoc in North-Western Europe. The big ash cloud will shut down air traffic at the Northern Hemisphere with catastrophic consequences for the global economy. If the wind direction is adverse, Denmark, Norway, Sweden, Great Britain, The Netherlands and Germany will have some ash fall and toxic gases. I think that pyroclastic flows from the VatnaJökull area are able to travel many miles over the Atlantic Ocean off the south-east coast of Iceland, posing a threat for shipping traffic. The usual wind is towards the northeast, so it would be northern norway to russia that would be in line of fire. The 2010 eruption with the difficult name happened during unusual weather – just our luck. The airline downtime would not be that much worse than when Eyjafjallajökull erupted. The big eruptions are usually not that long-lived. Look at Pinatubo for instance. Nor would the weather be that badly affected, we would get a colder winter and summer in the northern hemisphere, but not much more than that. I would though like to say that there was no VEI-7 eruption at Grimsvötn. It was a series of large VEI-6 eruptions spread out over 3 different cycles according to stratigraphic layering. Are there any hypotethical mechanisms proposed for the volcanic/seismic activity cycles mentioned in the post and comments? Are they observed just in Iceland or also in surroundings perhaps along the mid atlantic ridge. Maybe even on global scale? There are no good explanations for the cyclical behaviour in Iceland. If we ever find a good explanation “A Grand Unified Theory of Icelandic Volcanism” it would probably be very very complex indeed. The rifting is the easiest part to explain. It has to do with tensile/ductile strain resistabillity in the crust at the spreading zones. You could probably set up a formulation and get results pretty close to reality. The cyclical nature of the magma influx is though more of a conundrum. We just do not know enough about how mantleplumes operate. If there is any cyclicity at other places the reasons would be regional, as they are in Iceland. Interesting article, lots of info again, Carl, thanks! I am a bit reserved about the influence of the melting ice cap though. It is believed, I think, there was a max of 3000 meters of ice in the centres of accumulation during the last ice age. The whole of Iceland was covered by ice. 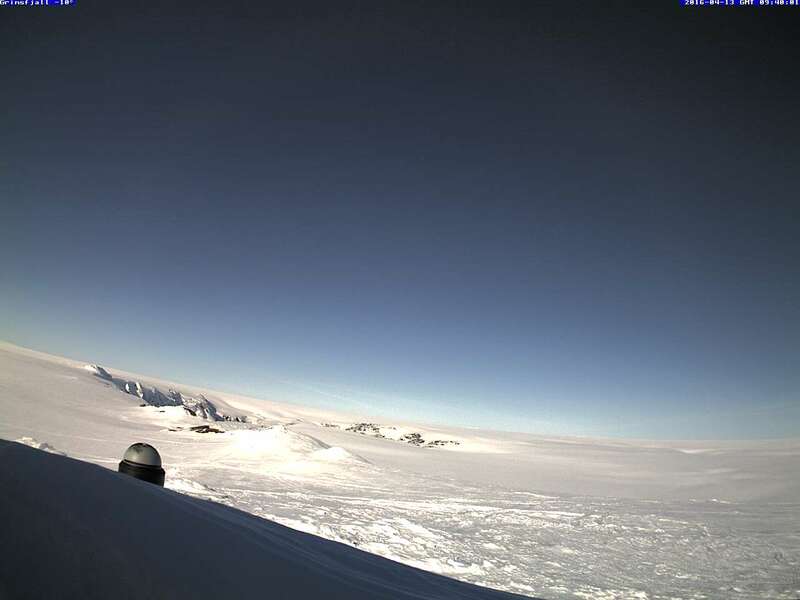 Just a bit of ice remains now, relatively small area, much thinner ice crust (average 300 m?). The influence of the vanishing remains would be that prominent that it adds to the benefit of volcanic activity in our age? Obviously the effect would be smaller in Iceland than compared to the deglaciation after the last iceage. Now, imagine what rapid loss of all that ice would do. I am not the only scientist convinced that the anthropogenic isostatic rebound will cause an increase in volcanism in Iceland and Antarctica. Recommendable paper that partially deals with the above. Do you think that with most of the recent rifting action to the north of Vatnajökull, this decreases the risk of anything happening south or does it just not work that way? If BB follows the same pattern of quakes when the caldera was sinking, there should be a reasonably good size quake M3+ very soon. Right now just as it did before, it would go very quiet for a few days and then a quake in the south that evens things out. Guess we will see soon. The different areas do their business individually, instead it even looks like the risk increases if an adjacent area has had a rifting event since it should increase the strain in adjacent rift zones. Let us look what happened in the previous cycle. Then we had Laki in 1783 and in 1797 we got the original Holuhraun. In the last 50 years we have had 3 rifting episodes. First we had the Vestmannaeyjar rifting episode with Surtsey and Eldfjall, after that we had Krafla Fires, and now we had Holuhraun. Partially that could have affected Theistarerykjarbunga north of Krafla, but it seems like nothing happened there. Between Krafla and Holuhraun we have Fremri-Namur and Askja, Askja seems to have been slightly affected but there are no signs as of yet that it will erupt. And between Holuhraun and Vestmannaeyjar we ave Grimsvötn and Katla. If I had to take a pick for which volcano would do the rifting in this cycle I would go with Katla, but that is something for a rainy day to write about. As you know we had to move house to a new and improved site a while ago. For various reasons we could not move all of the old articles from the old site. But, many of the old articles are really good and deserve to be reposted in here. We are currently curating them and selecting those that we feel are worthy of being reposted. In that we are also taking due care to remember large eruptions like El Hierro, Kelud, Nishinoshima and Bárdarbunga. So, do not be surprised if you all of a sudden find yourself reading about the upcoming eruption at El Hierro, or another place. The Oldies articles will be published on Wednesdays from now on. There might sometimes be more than one. Hope there will not be to much confusion caused by this. This is a really stupid question, but I have to ask. Theoretically, could there ever be a fissure eruption along the entire section of the mid-atlantic ridge that crosses Iceland? I’m talking about an eruption with curtains of fire that litterally split Iceland in half, separating the east and west sections of the country. What would it take for something like that to happen? A catastrophic tectonic plate movement and disruption. like, say the Moon colliding with the Earth. Right on the ridge. I think your scenario would be highly,very highly unlikely.. I wouldn’t want to find out..
Perhaps something like that happened during the big eruptions of the Deccan Traps and the Siberian Traps. It depends on how quickly these were deposited, You would need a very active hot spot. Neither are near an active rift though. I would guess that if a rift has formed, there is not enough strength in the rock to keep such a massive amount magma stored underground. The Toba eruption (http://www.volcanocafe.org/the-toba-supereruption/) would have been very interesting. It erupted along the entire ring fault around the developing caldera, and would have looked like your wish. While producing staggering amounts of lava (1 km3 every ten minutes!) (For nine days). But again, this is not a rift. Just a supervolcano. Within all of the answers, lies the nugget of truth. A massive energy expenditure to get it opened up and started. While the two sides store a large amount of tensional stress, much og that is released by thinning of the crust. There is just so much extention than can come into play when the two sides release. This effect is what causes the rift to open wider once in starts. A major shift in the prevailing dynamics of the interface could play into setting it up. But then you are left trying to determine a plausible mechanism and scenario thst could pull that off. Either way, it’s gonna be quite noticeable because of the energy release that would be needed to start the process. Not a lot of people will be able to not notice it. Good to bring the library of old posts to the new Cafe’. Also, it would be handy if the link collections “Whats up to” or “Whats going on” also could be moved! Back to regional cycles, I guess this is best studied in Iceland due to the excellent historical written track record and well investigated geology. But, are there similar cyclic activity variations observed in other regions? Hawai, Canarians, Italy, New Zealand? Sorry if I am asking very trivial questions! No, it is a very good question. Sadly I do not have an answer for you. I think the answer here is no. Finding evidence for cycles is pretty hard. It is not enough to have say three equally spaced eruptions: that could be a matter of chance. At least 5 are needed to make it convincing. For a 200-year cycle, that means you need at least 1000 year recording. In Iceland, volcanoes behaved differently when you go back more than 8000 years (as Carl mentions). That means that the longest cycle length that you can have any confidence about is 8000/5=1600 yr. And if eruptions in a cycle are more irregularly spaced, and the cycle shows up as eruptions bunching together, than you need more cycles to make your case convincing. The big problem with finding cycles, or predicting anything from a volcanic perspective is an issue of sample size. First, you get issues with eruption frequency limiting the amount of samples in a dataset. Then, you get an issue with being able to document all past eruptions, which is not easy. Then, you get the simple fact that within this time-frame, many volcanic systems will inherently change by the time any patterns can be noticed or realized. Iceland is a bit unique in that it’s very well studied, has had a high frequency of eruptions, and follows inherently cyclical patterns (rifting) that allow for this. Other areas of the world do not really share this. Could not add anything to this. If you want to find other places with discernible cycles, the best bet would be places with some commonality with Iceland. For a rifting cycle, unfortunately most of the candidate locations are underwater. But you might look for clumping of eruptions along Africa’s rift valley. Human-kept records there are probably abysmal until the very recent past, but since the rift valley volcanoes produce ashy eruptions, lake bed sediment cores might give some useful data on any clumping going back centuries or even millennia. For a magma plume cycle, the obvious best candidate is Hawaii, which also has frequent eruptions and has a hotspot. The question is, how far do decent-enough records extend back at Hawaii? I would say that the records are just to short in all other places to say anything about cycles. Only place where it could be recorded are for Greek and Italian volcanism, but there seems to be no or very weak support for cyclicity there. The Greek volcanoes erupt to seldom to say anything, the same goes for the Italian mainland volcanoes. Etna might have a cycle that I am unaware of. The man to answer that is Boris Behncke. I was wondering (as usual). This 24h cycling or “pulsing” has returned to VON station on the high to mid frequencies. Kinda similar to what we were observing weeks to days prior to the main swarm onset in August 2014 or even before. Related, or is it just hydro-thermal activity? Its interesting because its not during daytime, but during late night and morning. And its not wind noise. That one is evident between 8th and 10th approx. I am not 100% sure about some of the other peaks, I did not check the wind, but the last two was very strong at VON and pretty much nothing at any other station and the wind was way down. However, I think the VON station also suffers from being in a spot that can see localized winds, it could be this since it is related to the time of day and it is very sunny there the last few days. Guess we may find out. Well I would exclude localised winds because the signal is also appearing on the DYN station at the same time. That gives me confidence that Bardarbunga is the source of this signal. And if thermal winds would be the cause, they would have to be strong and would appear regulary on many stations in such locations and every year at a similar time at least for a while. and move the slider along hour by hour you can really see how strong some of the winds are in isolated spots and no wind at all not too far away. Well the activity is mostly nocturnal when there is no sun, and varies in time a bit, but happens regardless if the weather is cold, warm, windy, cloudy, sunny, stormy,… Adiabatic wind would be specific and linked to a certain weather pattern. My main interest is weather, so this is the first thing that came to mind. But the signal happens in all conditions, regardless of what the weather is. Between 8th and 10th you can see wind noise affecting VON as a cyclone passed by to the south, and rising the base levels on the freq. plots, but the signal is still in there, at the same period for the same duration, just a bit masked by wind noise. There is no correlation between the type of weather and the occurence of these pulses. I agree, but still without any real weather information at the location, localized weather cannot be completely ruled out as a cause. There are automatic weather stations throughout most of Iceland. They can be accessed via this page http://www.road.is/travel-info/road-conditions-and-weather/ and their data can be seen by clicking on each station’s “rectangle”. Jökulheimar is about 20 miles as the crow flies from Bb and its data could be compared with those from the equidistant Krepputunga. Well, then the wind should really be nicely periodic, and happening at the same time with the same strength, regardless if there is a cyclone over Iceland or a big fat ridge. Between 8th and 10th you hava a clear example what wind noise is. Unless there were 2 winds blowing at the same time at the same place with different speeds. 😉 Cylonic wind fields can dominate entire regions, and I do not believe that some local winds would blow at that time with a different strength, if that theory would hold, because despite VON and DYN being in the wind field from the cyclone, the signal appeared quite on time and in magnitude unaffected by the wind. The signal is nicely correlated between VON and DYN. And there is one more basic thing about wind. It affects ALL frequencies. Be it diurnal, thermal, stormy, cyclonic, wind is wind and it always leaves a well known signal, affecting all frequencies, but mostly high and mid. And it has a known look on the drums. In this case, the signal only appears on the high frequencies and doesnt leave a trace on mid and low frequencies. And if the wind would be blowing strong enough to raise the blue bar to that magnitude, than it would without a doubt leave a mark on the mid range aswell. Look at some classic GOD or GRF plots at the time of wind noise. For me personally, the data just doesnt support the wind noise theory, but I could be wrong of course. The low frequencies are picking up the wave action from increased wind over the general area, in general they rise and fall across the entire range of graphs when a larger storm moves in. The direction the wind is blowing, the specific location of the instrument and then how it is set also comes into play, some are more sensitive than others, look at the HUS graph during the 8th to 10th period , the blue line barely rises when compared to the others but the lower frequencies react about the same. The HUS picks up the hydrothermal tremor quite well as is shown by the thicker blue line so it is set up fairly sensitive. I’m not sure how valid it would be to directly compare one graph to another, but this is nothing more than a rank amateur who has been watching these stupid graphs for so long now giving his two cents for what its worth, so there is a strong to fairly strong chance I am completely out to lunch. My opinion would be that anything showing a once-daily periodicity just about has to be meteorological or anthropogenic, as it’s presumably strongly influenced by daylight. Volcanoes aren’t. In this case I would guess meteorological phenomenon, or hydropower plant. Well that would be hard to accept, given the nature of it is nocturnal, which is kinda opposite of human activity which is usually diurnal. And the signal is similar I have seen before from water or hydrothermal activity. This station is just W of Bardarbunga, at its feet and this signal is exactly the same in periodicy and length as those observed in August 2014, for whic it was said to be meltwater from Bardy at that time. And its not weather because this cycling is present regardless if there is a storm over Iceland or if its under a ridge like now. Wind noise generally has a well-known signal by now. A hydroplant could be, but only if it was working in 2014, then stopped and started working again recently, and it must be situated in the valleys below W Bardarbunga where the Vonaskard (VON) station is. Given all the factors, and given this signal has appeared before at this exact station I would go with possible water activity under Vatnajokull, perhaps Bardarbunga. The ice melt season will begin soon, or actually it already has. I would never really take much note of it, if I wouldnt have seen it before in August 2014 (not implying anything here, dont get me wrong). A few weeks ago I was wondering if something was up when seeing periodic disturbances on a number of stations when the weather was calm. The timing tended to be early hours and when looking at the weather obs for nearby stations eg http://en.vedur.is/weather/observations/areas/centralhighlands/#station=6776 it always tied in with localised strong winds (+20 m/s and presumably katabatic in nature). Wind noise leaves a well known signal on high and mid frequencies, while this signal is limited to high range only. I almost made Carl go for a walk the other day and you made me search out the signal you are referring to, maybe this will shed some light on this topic 🙂 I just had to explain even to myself what you are seeing. Glacial flood is looking almost the same as an eruption. A bit more high frequency is the difference. Looking again I would go with daily wind or melt. But, a stern warning here. Von is not that good for Vatnajökull, it covers a separate volcano and mini-glacier. Ie Vonarskard. Here’s another line of thought: VON is pretty near to Hagongulon which was built to dam rivers flowing from the W side of BB, and it feeds into the Thjorsa system which in turn runs the Sigalda HEP station. The station nearest Sigalda (VAT) is not showing this pulsing. SKO isn’t showing it either, and that is nearer to Hagongulon than VON. I infer that the pulsing at VON is not related to the river system(s). DYN isn’t showing the pulsing, but that is further from BB than VON but near to the Nornahraun dike/rift. It is also as near to glacial rivers as VON, if not nearer. The only conclusion my very amateur brain can draw is that whatever is causing the pulse on VON is very local. Good reasoning, that pretty much narrows it down to local meteorological or hydrological daily activity, my bet would be water run-off from Hagöngur. This sounds the most likely cause, some very nice sunny days. Here is another one that could be water or people or??? “Good reasoning” – from a scientist to someone who never, in the end, sat his science A levels, that’s very flattering. Thank you. In support of the run-off thesis, unlike DYN, VON is below south and west facing slopes. Well that thickens the plot (‘scuse the pun). THO is showing this activity but VON doesn’t. However, the VON tremor gauge does show the pulse at around this time. Also, if the “seismicity” on THO were (katabatic) wind, then it’s odd that it’s not showing at any nearby seismometers. After starting the discussion on AGW I thought I might bring something up with volcanoes and climate change in mind. I just read a paper (the math is over my old head) that the wobble of the earth’s axis (axial tilt) is changed (other things also affect it) by the earth going into or coming out of a Ice age. The paper discusses how the water (from us coming out of an ice age) will slowly make its way toward the equator. This mass pulls on the crust and causes the bulge in the crust at the equator to become larger (of course this happens over long periods of time) and probably affects plate movements. My question is how could we use this information to look at earth quakes of the past and possibly “guess” into the future to predict more or less volcanic activity/severity due to this process. I would expect that the rebound in the northern areas (from ice loss) could also come into this discussion. My first guess is we don’t have a detailed enough proxy (ice or sediments cores) to measure activity/severity. The other thought would be we may see a better signal of going into an ice age since that seems to happen much faster than the journey to a interglacial period. The paper is free access. Did you link to the right paper? The one here is not free access, and says that this polar wandering due to ice is negligible. It is clear that the mass loading of the continent by the ice can affect volcanoes: the weight may suppress the activity. When the ice melts, activity would increase due to magma melt. That is probably seen in Iceland. Found a answer here already that says there is enough detail to see these events in the sediments. Now I will try to find the paper. Github is running raw data unfiltered. Sometimes the automatic system shows earthquakes that are quite literally out of this planet. Could it be related to the M6.9 that took place in Burma around that time? It showed up on a lot of drum plots across iceland. I wouldn’t consider an earthquake to be off topic at VC, provided that it happened in or near a volcano or along a divergent plate boundary. (I include the latter because Laki initially announced itself with a swarm of increasingly violent quakes on the plate boundary but nowhere near any of Iceland’s central volcanoes). And an on topic statement; I went to a lecture by Bill McGuire at the Royal Institute to promote his book Waking the giant. He seemed pretty convinced that climate change will increase both the occurance and the size of volcanic activity and discussed the effect of glacial melt on specific volcanoes. It made a good read for a non specialist like me. It is a pretty much accepted part of volcanology by now. I am happy that you had the opportunity to go to that lecture with him. Out of curiosity, do we know the source of volcanism in Antarctica? Is it all rift oriented? With no subduction there, the volcanoes are kind of head scratchers, especially considering they seem to resemble stratovolcanoes. You have the Kerguelen mantleplume sitting under Antarctica. It is responsible for some volcanoes. I was more thinking continental Antarctica away from the Kerguelen mantle plume. The linear organization of the volcanoes would almost seem to imply a subduction front, except there is no subduction front there. I don’t really think this would be hotspot oriented either, since the volcanoes are spread out, although mantle plumes can be odd. If this were rifting oriented ala Africa, I wouldn’t assume we would see what looks like stratovolcanoes. Also, if this were a rift, it’s in a very odd location close to the edge of the Antarctic continent. I recall there was supposed to have been recent subduction along the antarctic peninsula, where the phoenix plate used to be. Not sure exactly where this would be. 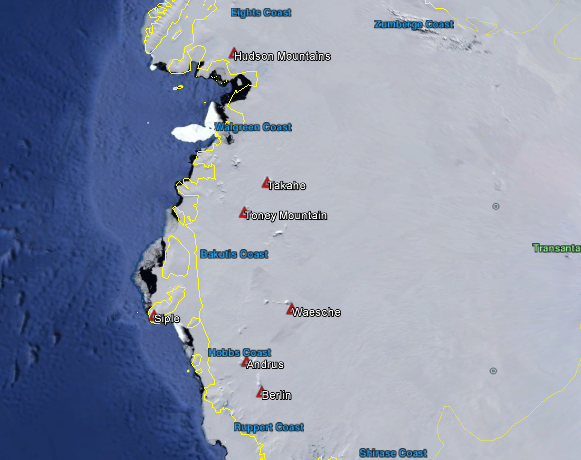 All Antarctic volcanoes are along west-antarctica, like an extension of the Andes chain. There may be some rifting between east and west antarctica but that is speculation. The BBC has a report researchers believe they have solved the mystery of ancient spiral-shaped holes in Nazca, Peru. It seems like IMO is out in the sunshine kicking on things to get them started again. So expect some weird signals today. It seems like the recent outbreak of earthquakes around the world is getting some attention. I remember an average I read once that 4.5 earthquakes average around 5 a day. I show 22 as of right now of 4.5 and over. Also most of the quakes hitting the area around the Japan quake are all showing a depth of 10k. Actually USGS estimate that there are around 35 M4-4.9 quakes a day, M6-6.9, there’s about one every second day somewhere in the world. Most happen in seismically active areas (!) – the shallow quakes which just hit Kumamoto are only newsworthy because they were shallow and hit close to an urban centre – so did some damage. Of course the “big one(s)” are coming, but connecting recent (relatively minor and “business as usual” quakes in Myanmar, the Philippines, Vanuatu to the ones in Japan is sensationalist journalism of the worst kind. Re global warming – anthropogenic, isostatic or magmatic – I would like to see records kept in the deeper coal mines of the world to see whether temperature increases are also occurring below ground. Global warming appears to be uneven and changes in wind direction or convection currents are locally having an effect. Best to look at the oceans, as they are much more stable and take up 93% of the heat. 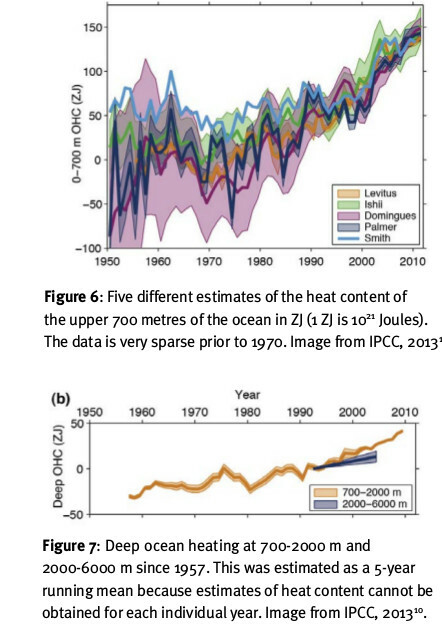 The plot show IPCC data: both surface and deeper areas of the ocean are continuing to heat up. I got this plot from a publication of Imperial College. The ocean warming started around 1980, and perhaps 10 years later at depth – it takes time for surface water to mix down. This plots heat content: at the surface the increase is about 0.5C. Thank you for this detailed information. This is clear evidence of surface warming but I was thinking more along the line of the Mid-Atlantic Ridge and the area to either side of it which may be showing an increase in heat emissions, and so which may be raising the temperature of the ocean from below. Interesting question. The ocean weighs about 10^21kg. The earth generates about 50TW of internal energy, or about 10^21 J per year. It takes 4000 J to heat 1 kg of water by 1C. Therefore, over the 35 years that global warming has been measurable (since 1980), the internal heat of the Earth could have warmed the ocean by 0.01C. This assumes that all internal heat escapes through the ocean floor, which is not far from the truth. The mid oceanic ridges are powered by this energy. But the same heat was also generated before 1980, so the ocean temperature already included this. It can fluctuate a bit from year to year, but is by less than the total. I am afraid that global warming is very real. And I use the word ‘afraid’ deliberately.